Last year I met up with Simon McManus in a Brighton pub where he told me about his plan to run a conference dedicated to progressive enhancement. “Sounds like a great idea!”, I said, and offered him any help I could. With the experience of organising three dConstructs and three Responsive Days Out, I was able to offer some advice on the practical side of things like curation, costs and considerations. Simon also asked me to MC his event. I was only too happy to oblige. After all, I was definitely going to be at the conference—wild horses wouldn’t keep me away—and when have I ever turned down an opportunity to hog the mic? 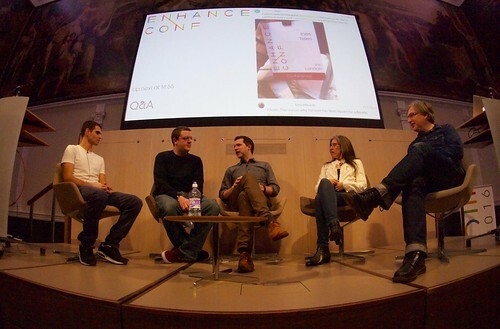 Simon chose a name: EnhanceConf. He found a venue: The RSA in London. He settled on a date: March 4th, 2016. He also decided on a format, the same one as Responsive Day Out: four blocks of talks, each block consisting of three back-to-back 20 minute presentations followed by a group discussion and questions. With all those pieces in place, it was time to put together a line-up. I weighed in with my advice and opinions there too, but the final result was all Simon’s …and what a great result it was. Yesterday was the big day. I’m happy to report that it was a most splendid event: an inspiring collection of brilliant talks, expertly curated like a mixtape for the web. Nat got the day off to a rousing start. They gave an overview of just how fragile and unpredictable the World Wide Web can be. To emphasise this, Anna followed with detailed look at the many, many console browsers people are using. Then Stefan gave us a high-level view of sensible (and not-so-sensible) architectures for building on the web—a talk packed to the brim with ideas and connections to lessons from the past that really resonated with me. After that high-level view, the next section was a deep dive into strategies for building with progressive enhancement: building React apps that share code for rendering on the server and the client from Forbes; using Service Workers to create a delightful offline experience from Olly; taking a modular approach to how structure our code and cut the mustard from Stu. The after-lunch session was devoted to design. It started with good ol’ smackdown between Phil and Stephen, which I attempted to introduce in my best wrestling announcer voice. That was followed by a wonderfully thoughtful presentation by Adam Silver on Embracing Simplicity. Then Jen blew everyone away with a packed presentation of not just what’s possible with CSS now, but strategies for using the latest and greatest CSS today. Finally, the day finished with a look to the future. And the future is …words. Robin was as brilliant as ever, devising an exercise to get the audience to understand just how awful audio CAPTCHAs are, but also conveying his enthusiasm and optimism for voice interfaces. That segued perfectly into the next two talks. Stephanie gave us a crash course in crafting clear, concise copy, and Aaron tied that together with Robin’s musings on future interactions with voice in a great final presentation called Learn From the Past, Enhance for the Future (echoing the cyclical patterns that Stefan was talking about at the start of the day). As the day wrapped up, I finished by pointing to a new site launched by Jamie on the very same day: progressiveenhancement.org. With that, my duties were fulfilled. I thoroughly enjoyed listening to the talks and then quizzing the speakers afterwards. 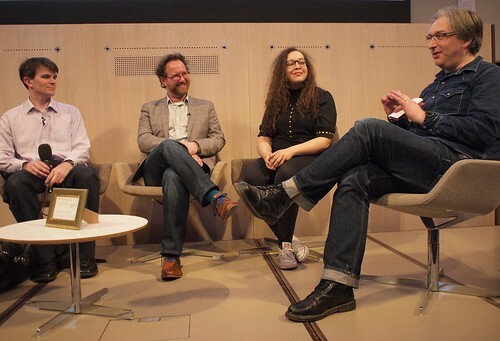 I really do enjoy moderating events. Some of the skills are basic (pronouncing people’s names correctly, using their preferred pronouns) and some are a little trickier (trying to quickly spot connections, turning those connections into questions for each speaker) but it’s very rewarding indeed.